Abolhasani, M., Asgari, M., Keymoosi, H. (2013). Splenogonadal Fusion Associated with Bilateral Cryptorchidism, Presenting as an Operative Surprise - Report of a Case. Iranian Journal of Pathology, 8(1), 55-58. Maryam Abolhasani; Mojgan Asgari; Hossein Keymoosi. "Splenogonadal Fusion Associated with Bilateral Cryptorchidism, Presenting as an Operative Surprise - Report of a Case". 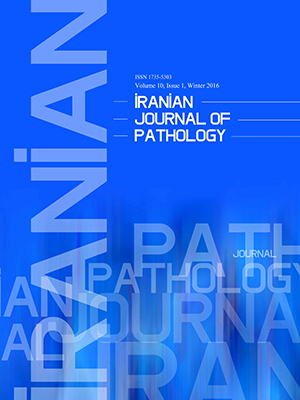 Iranian Journal of Pathology, 8, 1, 2013, 55-58. Abolhasani, M., Asgari, M., Keymoosi, H. (2013). 'Splenogonadal Fusion Associated with Bilateral Cryptorchidism, Presenting as an Operative Surprise - Report of a Case', Iranian Journal of Pathology, 8(1), pp. 55-58. Abolhasani, M., Asgari, M., Keymoosi, H. Splenogonadal Fusion Associated with Bilateral Cryptorchidism, Presenting as an Operative Surprise - Report of a Case. Iranian Journal of Pathology, 2013; 8(1): 55-58. Splenogonadal fusion is a rare entity with approximately 150 reported cases until the year 2005. The entity is a rare congenital anomaly in which there is fusion of splenic and gonadal anlagen or mesonephric derivatives. Splenogonadal fusion has two continuous and discontinuous types. About ten cases have been reported to be associated with bilateral cryptorchidism in literature. Very few cases have been diagnosed preoperatively. Many cases present as a testicular swelling and undergo an unnecessary orchiectomy with the suspicion of a testicular neoplasm. Herein, we report a new case of discontinuous splenogonadal fusion in a 29 years old man with bilateral cryptorchidism who underwent surgery. Surprisingly two masses were noted adjacent to undescendent testis in left groin in operative room which were resected and proved to be a new case of splenogonadal fusion in histological exam. Khairat AB, Ismail AM. Splenogonadal fusion: case presentation and literature review. Pediatr Surg 2005;40(8):1357-60. Carragher AM. One hundred years of splenogonadal fusion. Urology 1990;35(6):471-5. Diebold J, Le Blaye O, Le Tourneau A, Marichez P. Intra-scrotal supernumerary spleen. A long silent case of discontinuous spleno-gonadal fusion. Ann Pathol 1990;10(3):174-6. Karaman MI, Gonzales ET Jr. Splenogonadal fusion: report of 2 cases and review of the literature. J Urol 1996;155(1):309-11. Keyik B, Yanik B, Conkbayir I, Tuygun C, Kizilgoz V, Hekimoğlu B. Continuous-type splenogonadal fusion associated with an ipsilateral testicular atrophy: sonographic findings. J Clin Ultrasound 2010;38(3):161-3. Bostwick DG, Cheng L. Urologic Surgical Pathology. 2nd ed. China:Elsevier Inc;2008. Cortes D, Thorup JM, Visfeldt J. The pathogenesis of cryptorchidism and splenogonadal fusion: a new hypothesis. Br J Urol 1996;77(2):285-90. Hizli F, Uygur MC, Irkkan C. Splenogonadal fusion: report of a case. Int J Urol 2005;12(6):591-2. Basnyat PS, Jones DA, Morgan RJ, Davies CJ, Foster ME. Splenogonadal fusion: report of a rare variety. J R Coll Surg Edinb 2001;46(2):108-9. Guarin U, Dimitrieva Z, Ashley SJ. Splenogonadal fusion-a rare congenital anomaly demonstrated by 99Tc-sulfur colloid imaging: case report. J Nucl Med 1975;16(10):922-4. Braga LH, Braga MM, Dias MA. Laparoscopic diagnosis and treatment of splenogonadal fusion associated with intra-abdominal cryptorchidism in a child. Pediatr Surg Int 1999;15(7):465-6. Khelif K, Maassarani F, De Keuleneer R, Segers V. Splenogonadal fusion: a case report. Acta Chir Belg 2010;110(6):607-8. Molaeian M, Shojaei H. Splenogonadal fusion presented with cryptorchidism. Urol J 2009;6(2):130-1. Duncan WL Jr, Barraza MA. Splenogonadal fusion: a case report and review of literature. J Pediatr Surg 2005;40(12):e5-7. Knorr PA, Borden TA. Splenogonadal fusion. Urology 1994;44(1):136-8. Al-Marhoon M, Matthew J, Nirmala V, Kehinde EO. Splenogonadal fusion associated with primary male infertility. BJU Int 2000;86(4):560-1. Breda G, Zattoni F, Artibani W, Brunetti A, Vancini P. Splenogonadal fusion. Chir Ital 1976;28(6):862-8. Kaya C, Koca O, Karaman IM, Radmayr C. Splenogonadal fusion in a 13-year-old boy with contralateral displaced intra-abdominal testis. Urology 2010;75(1):173-5. Bearss RW. Splenic-gonadal fusion. Urology 1980;16(3):277-9.